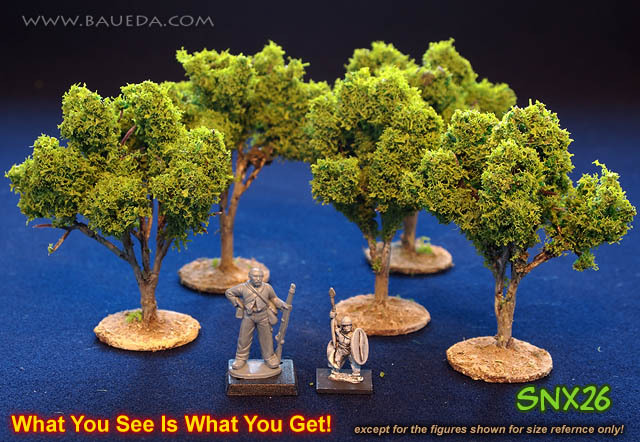 The importance of scenic and terrain elements is too often underestimated, but we believe they are essential to the full enjoyment of the wargaming experience. We have found that the best method to represent different terrain types on the table, like brushy and rocky ground, woods, swamps, etc. 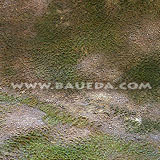 is to use a combination of terrain pads and scenic markers of the appropriate type. The terrain pad delimits the exact area, it is easy to store and position and stays firmly put on the table. The scenic markers clearly indicate the type of area represented, can be conveniently set aside to let figures move through, and most importantly looks good! 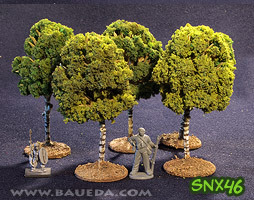 In this section for the moment you'll find only trees and shrubs as terrain markers for wooded areas, but we hope to continue to add to this range to cover for all the typical regions of this world and who know, maybe other planets too... We will also soon also expand the range adding suitably beautiful handpainted terrain pads! 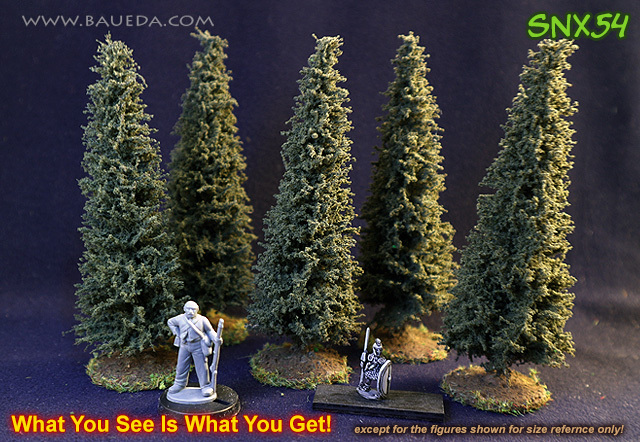 All the tree scenic markers are completely hand assembled and finished, based and painted to the very high standard you can see here. Plants are mounted on thick steel washers, which add stabilty and makes for a very solid base indeed! Each pack contains the scenic markers of the style shown in the number indicated, based and painted exactly as you see in the color picture. 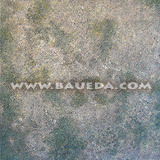 Being a handmade product however please understand there will always be some small differences from piece to piece, still, you can rest assured that every piece you will get satisfy the exceptionally high BAUEDA quality standard! 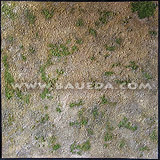 Click here for handpainted terrain mats! 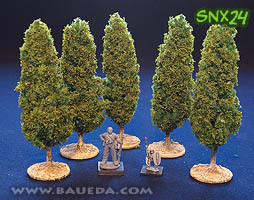 Perfect for Elm, Cedar, Platanus and any other large open, irregular deciduous tree! 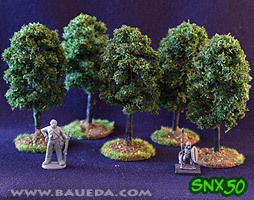 Best suited for playing with 28mm to 15mm figures (as shown). 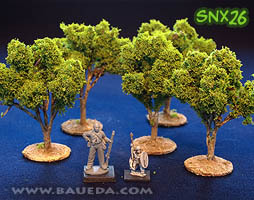 A small deciduous tree, approximately 80mm high, plastic frame, based on heavy 32mm steel washers for extra stability. Perfect for any orchard tree! 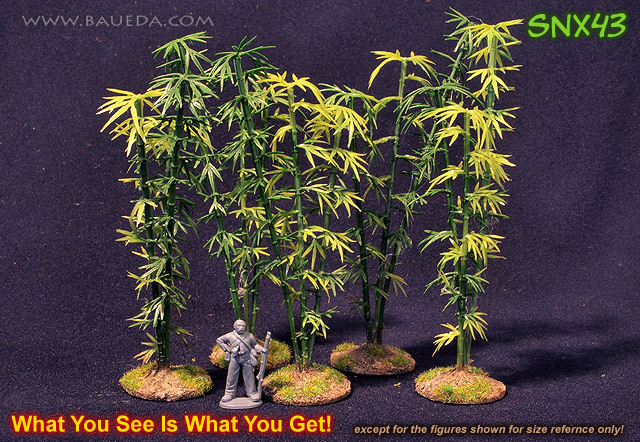 Best suited for playing with 15mm figures (as shown). A short, round deciduous tree, approximately 60mm high, plastic frame, based on heavy 32mm steel washers for extra stability. Perfect for any orchard tree! 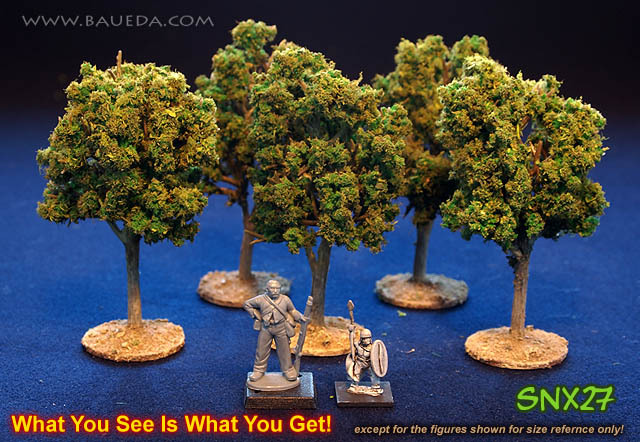 Best suited for playing with 28mm figures (as shown). A medium, round deciduous tree, approximately 80mm high, plastic frame, based on heavy 32mm steel washers for extra stability. Birch trees! 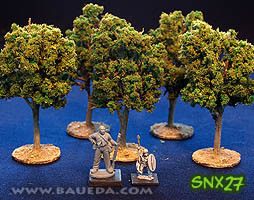 Best suited for playing with 28mm to 15mm figures (as shown). 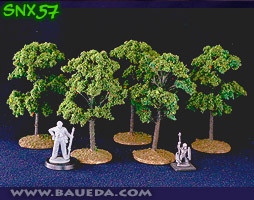 A medium size deciduous tree, approximately 85mm high, plastic frame, based on heavy 32mm steel washers for extra stability. Unfortunately these are OUT of STOCK at the moment. More will be available soon, just drop us a line if you want us to send you a note as soon as these are back! Perfect for Pines and any other oval shaped tree! 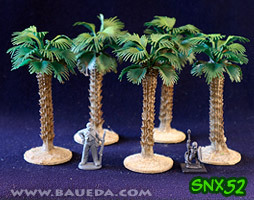 Best suited for playing with 28mm to 15mm figures (as shown). 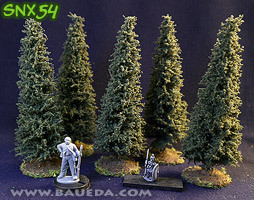 A small tree, 85mm high, plastic frame, based on heavy 32mm steel washers for extra stability. Perfect for Pines and any other oval shaped tree! 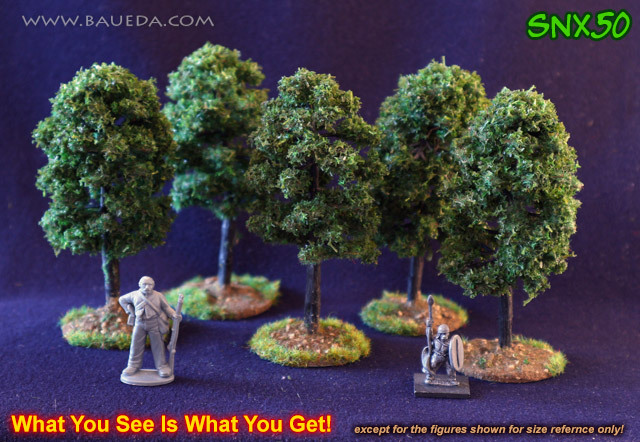 Best suited for playing with 28mm to 15mm figures (as shown). 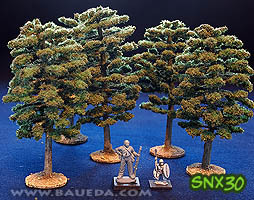 A large tree, 120mm high, plastic frame, based on heavy 32mm steel washers for extra stability. 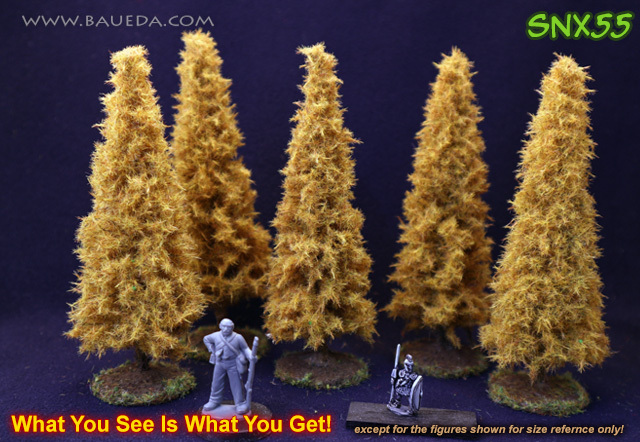 Perfect for any Fir or Spruce tree! 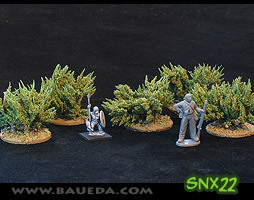 Best suited for playing with 28mm to 15mm figures (as shown). A slender tree, 120mm high, metal frame, based on heavy 32mm steel washers for extra stability. 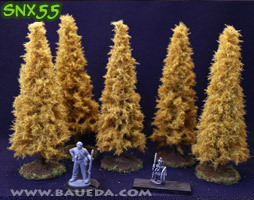 Perfect for any Larch (Larix) tree! 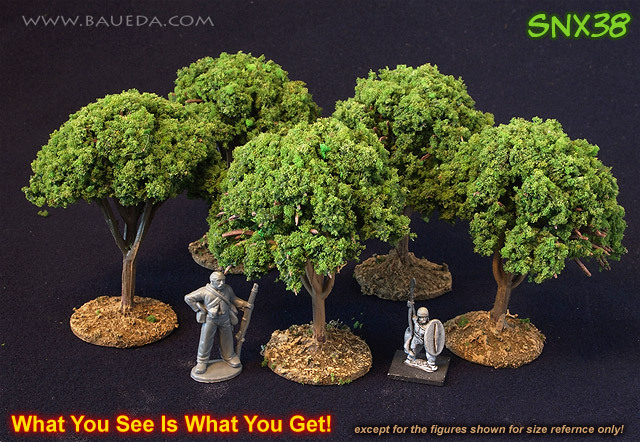 Best suited for playing with 28mm to 15mm figures (as shown). A slender tree, 120mm high, metal frame, based on heavy 32mm steel washers for extra stability. 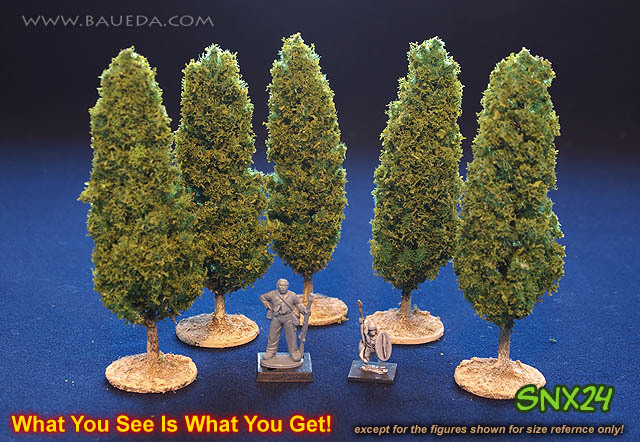 Perfect for Poplar, Cypress and any other columnar shaped tree! 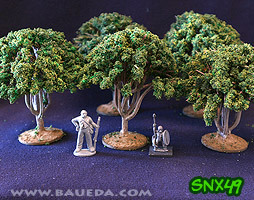 Best suited for playing with 28mm to 15mm figures (as shown). A tall but slender deciduous tree, approximately 115mm high, plastic frame, based on heavy 32mm steel washers for extra stability. Perfect for any conical shaped tree! 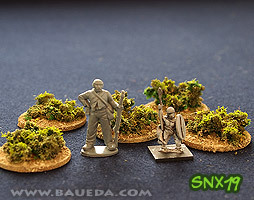 Best suited for playing with 28mm to 15mm figures (as shown). A small slender tree, 90mm high, plastic frame, based on heavy 32mm steel washers for extra stability. Perfect for smaller American Elm and most fruit trees! 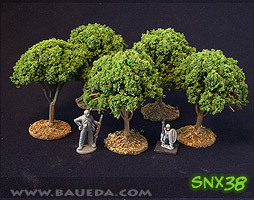 Best suited for playing with 28mm to 15mm figures (as shown). A medium size deciduous tree, approximately 80mm high, plastic frame, based on heavy 32mm steel washers for extra stability. Perfect for Ash, Beech, Maple and any other round shaped deciduous tree! 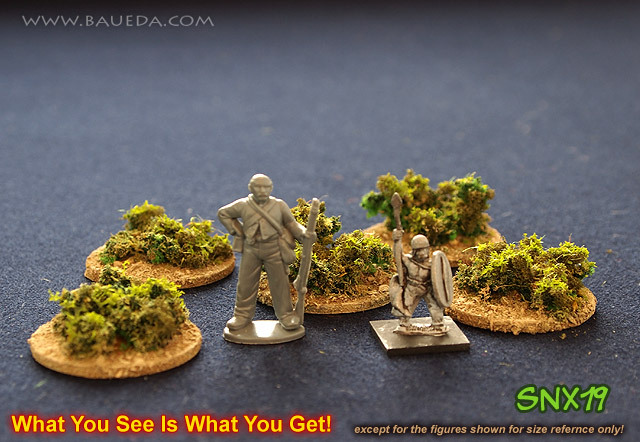 Best suited for playing with 28mm to 15mm figures (as shown). 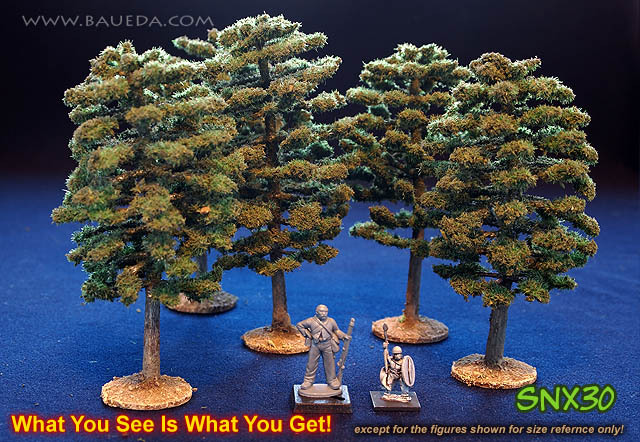 A medium size deciduous tree, approximately 90mm high, plastic frame, based on heavy 32mm steel washers for extra stability. Perfect for Ash, Beech, Maple and any other round shaped deciduous tree! 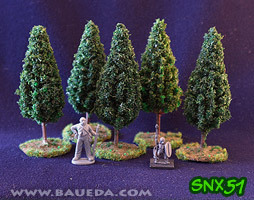 Best suited for playing with 28mm to 15mm figures (as shown). A small size deciduous tree, approximately 60mm high, plastic frame, based on heavy 32mm steel washers for extra stability. 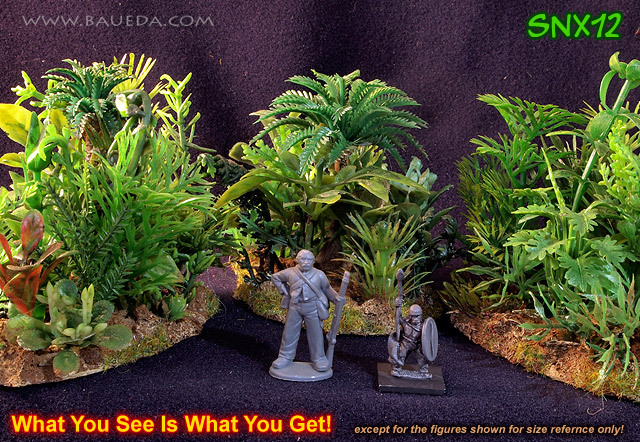 Perfect for any tropical forest and jungle! 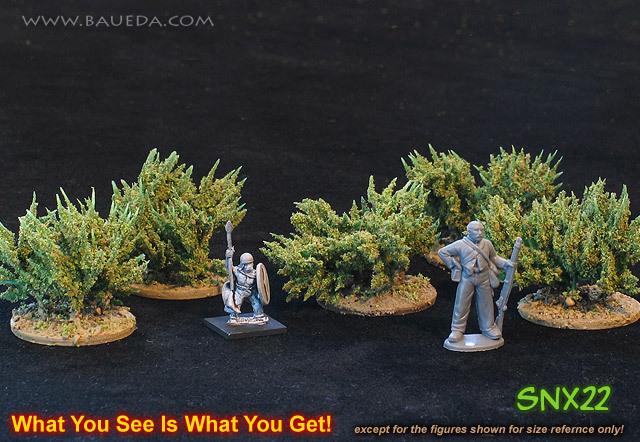 Best suited for playing with 15mm to 28mm figures (as shown). 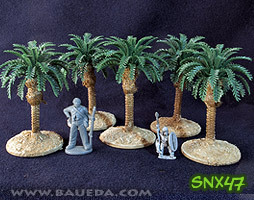 A medium plastic fan palm, approximately 90mm high, based on heavy 32mm steel washers for extra stability and painted to match natural colors. 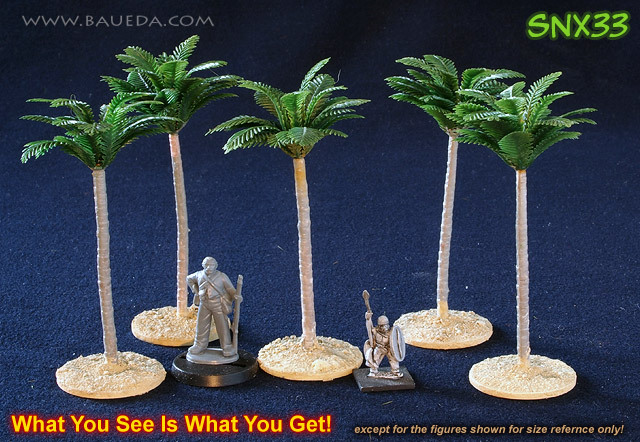 Perfect for any tropical beach, desert oasis or jungle! 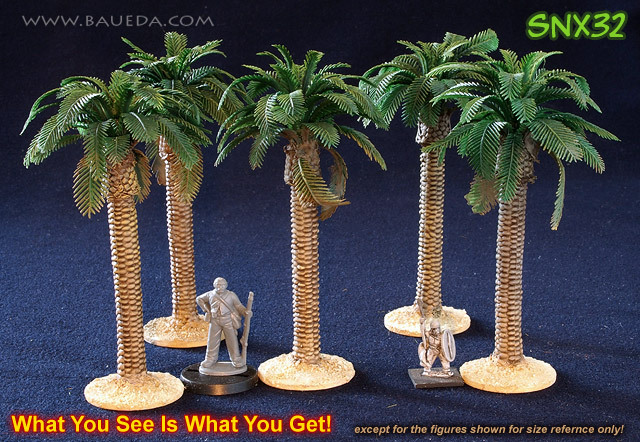 Best suited for playing with 15mm to 28mm figures (as shown). A large plastic palm, approximately 100mm high, based on heavy 32mm steel washers for extra stability and painted to match natural colors. Perfect for any desert oasis or jungle! 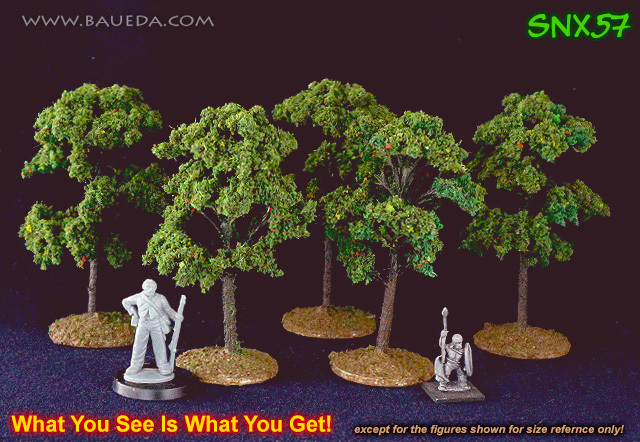 Best suited for playing with 15mm to 28mm figures(as shown). 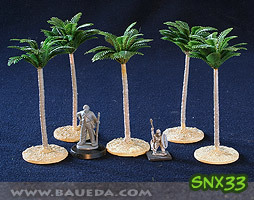 A medium plastic palm, approximately 85mm high, based on heavy 32mm steel washers for extra stability and painted to match natural color. Perfect as date palms, on any tropical beach, desert oasis or jungle! 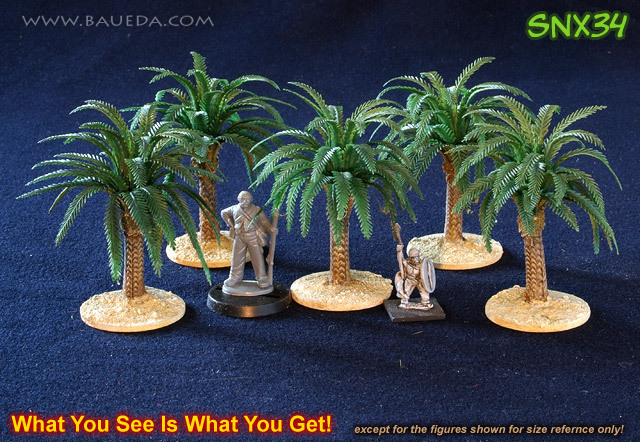 Best suited for playing with 15mm to 28mm figures(as shown). 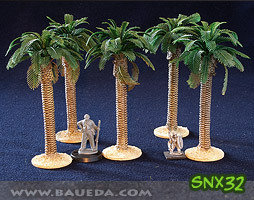 a small plastic palm, approximately 60mm high, based on heavy 32mm steel washers for extra stability and painted to match natural colors. 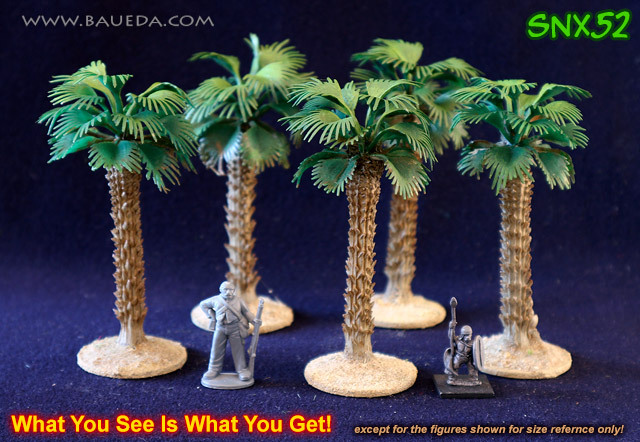 Perfect as date palms, on any tropical beach, desert oasis or jungle! 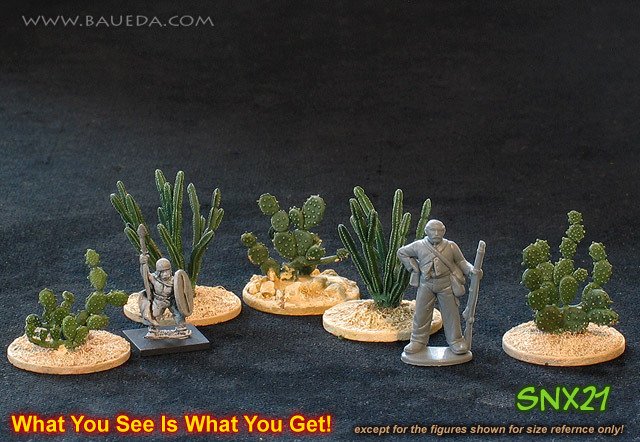 Best suited for playing with 15mm to 28mm figures(as shown). a small plastic palm, approximately 50mm high, based on heavy 32mm steel washers for extra stability and painted to match natural colors. 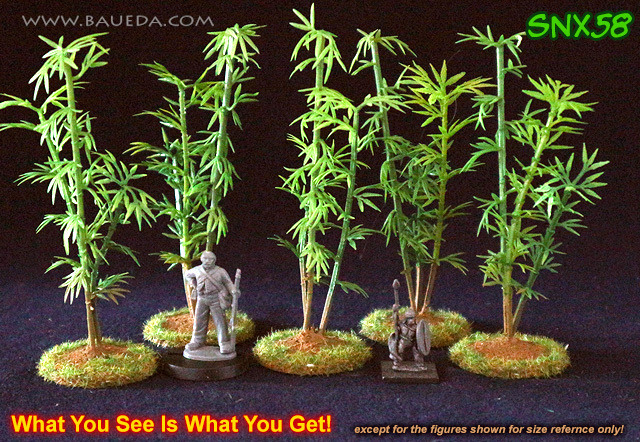 Perfect for any Oriental setting and jungle! 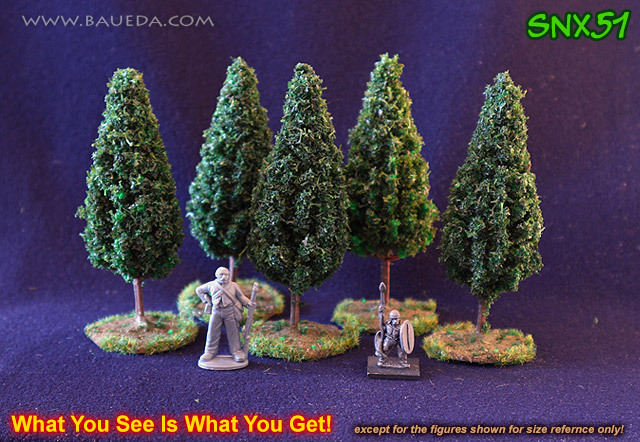 Best suited for playing with 28mm figures (as shown) or larger. Clumps of three higly detailed, steel core, plastic bamboos in natural colors, approximately 120mm high, based on heavy 32mm steel washers for extra stability! 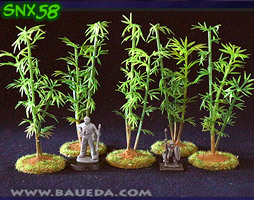 Perfect for any Oriental setting and jungle! 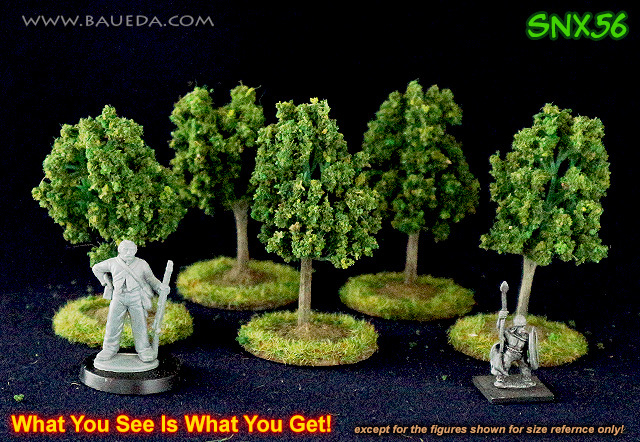 Perfect for playing with 15mm and 28mm figures (as shown). 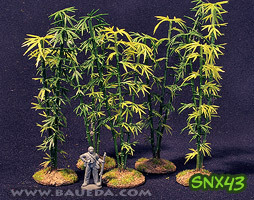 Clumps of three higly detailed plastic bamboos in natural colors, approximately 90mm high, based on heavy 32mm steel washers for extra stability! 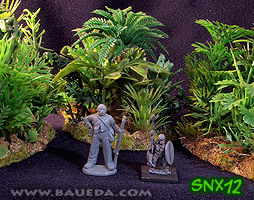 Large jungle markers! 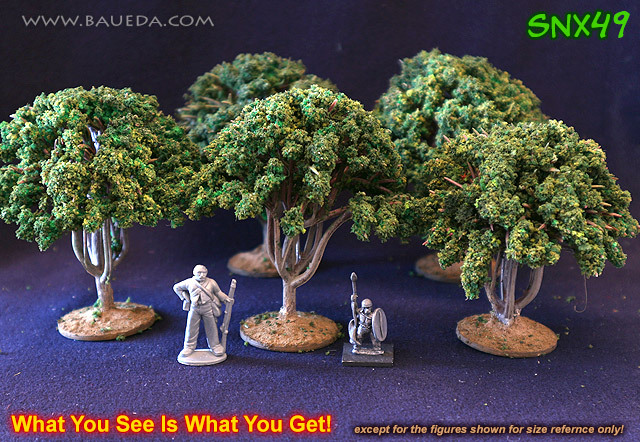 Best suited for playing with 28mm figures(as shown) or larger. 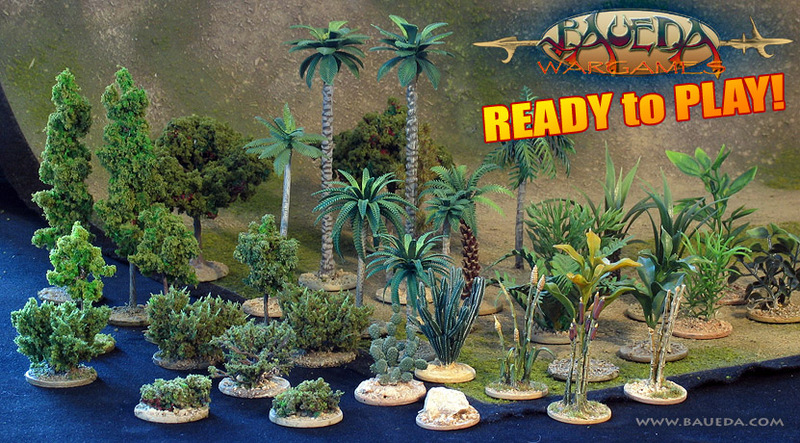 3 bases with beveled edges, approximately 90x60mm wide and 70mm high, these spectacular scenic elements are filled with a wide variety of assorted plastic plants from over two dozens different types! 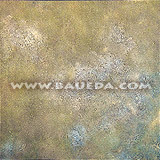 Textured surface, flocking and several passes of shadows and highlight combine to achieve a stunningly beatiful effect. Currently in stock: 1 set ONLY! Perfect for any terrain! 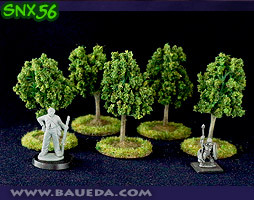 Best suited for playing with 15mm to 28mm figures(as shown). 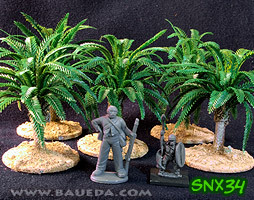 5 flocked plastic plants, approximately 35mm high, based on heavy 32mm steel washers for extra stability. Currently in stock: 0 sets, more coming next week! Perfect for Mediterrenean and Middle east! 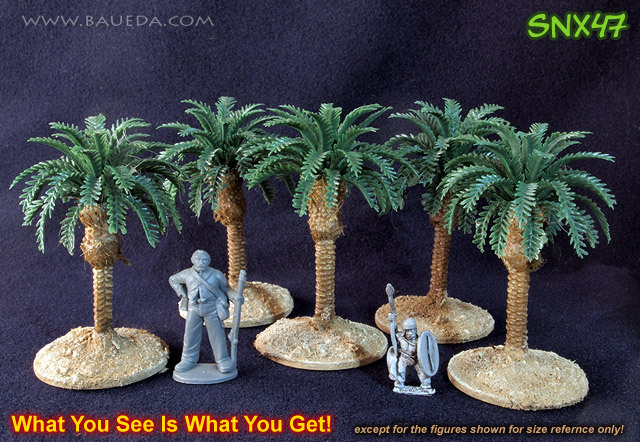 Best suited for playing with 15mm to 28mm figures(as shown). 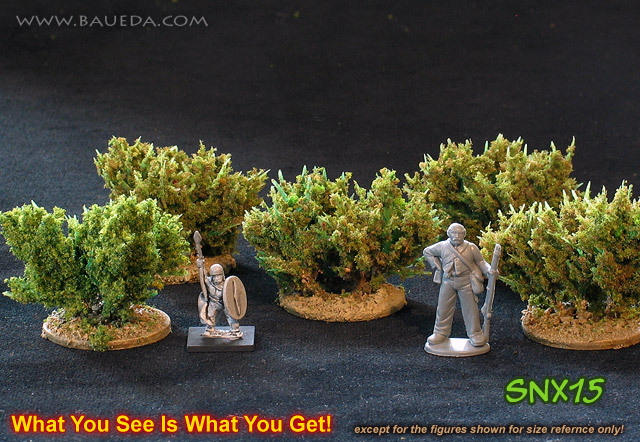 Perfect for shrubs and bushes! 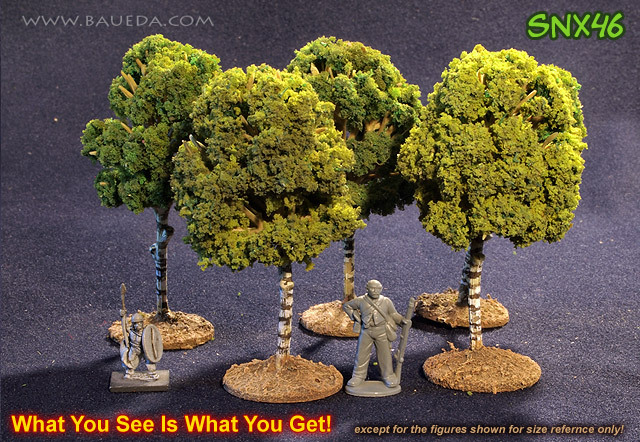 Best suited for playing with 15mm to 28mm figures(as shown). 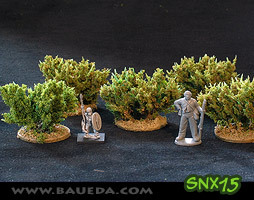 5 small steel wire shrubs, approximately 15mm high, based on 32mm steel washers. Perfect for your desert! 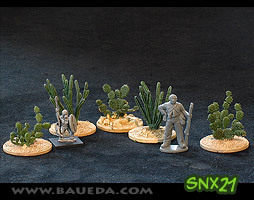 Best suited for playing with 15mm to 28mm figures(as shown). 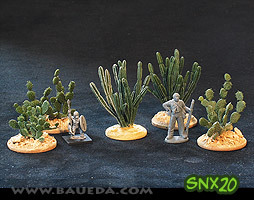 5 plastic cactus clumps, approximately 40mm high, made with Pegasus Hobbies plastic cactus (The Museum Models Collection, 6507 set #1 - from1/2" to 2" tall) based on 32mm steel washers and painted to match natural color. 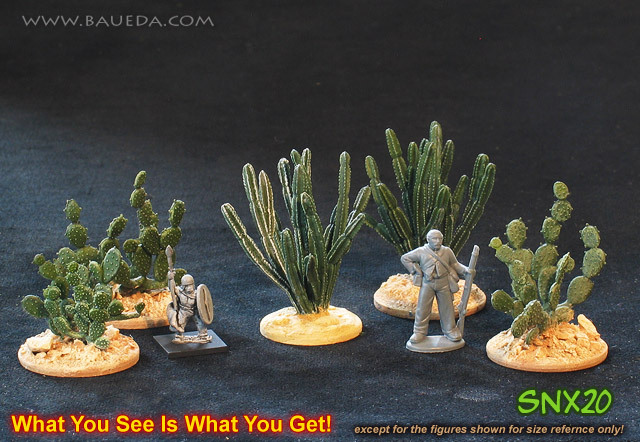 5 plastic cactus clumps, approximately 20mm high, made with Pegasus Hobbies plastic cactus (The Museum Models Collection, 6508 set #2 - from 5/16" to 1 1/4" tall) based on 32mm steel washers and painted to match natural color.